The Lions Portarlington Market is rapidly becoming the most popular community market on the Bellarine Peninsula. Since taking over the running of the market in October 2018, the Club has greatly expanded the line-up of stalls, entertainment and other attractions. Spread over Little Reserve with views ofCorio Bay, more than 100 stalls offer arts, crafts, produce, plants and novelties. A food court (with seating) caters for most tastes, while buskers, clowns and ‘witches’ provide entertainment. Lions saved the market after Portarlington Primary School, which controlled the popular event for the past 10 years, decided to refocus its fund-raising activities. Club President Geoff Smith,said the Club welcomed the opportunity to secure the future of such an important community event and allow it continue as a drawcard for Portarlington and a source of funding for community projects. LionsPort Market is held on the last Sunday ofeach month between 9.00am and 2.00pm. Enquiries, bookings: 0490 260 574 of Facebook Lions Port Market. Twenty-eight local organisations benefited from the Community Raffle conducted by the Lions Club of Portarlington/Drysdale. By participating in the raffle, the organisations shared in ticket sales of $22,628. Unlike other raffles, all money raised by the Lions Community Raffle is returned to the participating organisations (ticket sellers), such as local schools, sporting clubs, etc. thereby keeping the money in the local community. The Lions Club manages the running of the raffle and provides the prizes, obviating the need for participating organisations to run their own raffles. The Lions Community Raffle is one of the Club’s major annual projects and has paid out more than $122,000 since it was launched in 2010. Tickets were sold during July-August with big sellers including the Bellarine Anglican Parish, Winged Horse Equine Welfare, Drysdale Sport Fishing Club, Drysdale Soccer Club and Portarlington Football/Netball Club. Thirteen prizes totaling $4,000 in value were drawn during a special function at Portarlington Golf Club on 30 August. The Lions Club thanks all those businesses who generously contributed raffle prizes and all those who purchased tickets. 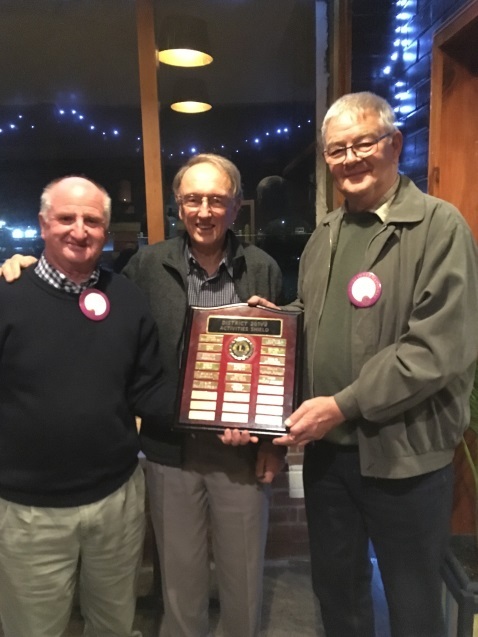 Portarlington/Drysdale Lions has won the annual Activities Shield for being the top fundraising Club in Lions District 201V2 in 2017-18. Over the year, the Club distributed $60,094 to local community groups and organisations. In addition, $7,000 was donated to the Western District bushfire relief appeal and $3,000 to various Lions national and international causes. Lions District 201V2 covers most of western Victoria from Williamstown to the South Australian border. The Club’s major fundraisers included the Community Raffle, Charity Golf Day, Crayfish Spins, Lions Op Shed and ‘Buggy Bonanza’ raffles run in local caravan parks over Christmas-New Year. Main beneficiaries of Club donations included local junior sporting clubs and primary schools, from which 12 pupils were funded to attend the Lions Licola Wilderness Camp in January.